It is quite easy to reach our hotel in consideration that it is placed in the very centre of the city, easy to reach on foot making a little promenade, or via public or private waterbus you’ll easily find at your arrival terminal. Piazzale Roma, or in alternative you can choose Tronchetto Parking: in this case, you have to take the People Mover train to arrive at Piazzale Roma. d’Oro stop (the trip is 20/30 minutes and it goes through a wonderful part of Canal Grande). find and in a 20 meters you’ll reach Locanda Leon Bianco. When you arrive at Venice Santa Lucia Train Station, we suggest you to catch public boat (ACTV) n° 1 and get off at the Ca’ d’Oro stop (more or less 20/30 minutes, a very nice tour of one of the most beautiful parts of the Canal Grande). When you reached the main road (Strada Nuova), take the right and keep on: at Campo Santi Apostoli take the bridge you have on the right. Cross the bridge and turn on the right, after 20 meters you’ll reach Locanda Leon Bianco. 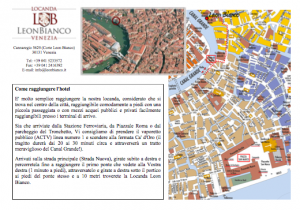 need to follow the map you can download from our website, in 10 minutes you will arrive at Locanda Leon Bianco. If you prefer, you can reach our Locanda Leon Bianco by foot from Venice Santa Lucia Train Station or Piazzale Roma, 30 minutes walking through one of the most important streets of Venice, Strada Nuova. When you reach Campo Santi Apostoli, you cross the little bridge you have on your right, after the bridge you turn right again and after 20 meters you will find our Locanda Leon Bianco. Our staff will be happy to help you and give you all the information you need. door you can come directly inside our hotel when you get off from the taxi!